Whether you need to replace the hose that was originally included with your vac or want the extra reach of a longer hose, the RIDGID family of hoses has a solution for you. This RIDGID 20 foot Locking Wet/Dry Vac Hose contains all the great features of our standard replacement hose and is nearly 3 times the length. It includes all of the adapters needed to fit any RIDGID and most other brands of vacuums. Flexible, 2-1/2 in. diameter hose resists clogging. Tug-A-Long feature locks hose in place to prevent it from pulling loose during use. Fits all Ridgid Wet/Dry vacuums and many other brands that accept a 2-1/2 diameter hose. For more information, please call 1-800-4-RIDGID (1-800-474-3443). Powerful 10 Amp., 5 Peak HP motor, 8 US Gallon (30L) corrosion resistant plastic tank with tank water drain. Comes complete with 6 ft. x 1-1/4 thread-on hose, 2 pc. plastic extension wand, 30L dust bag, cartridge filter, foam filter, re-usable filter, 10 floor sweep and crevice tool. The RIDGID RV2400A 53 litre (14 U.S. gallon) large capacity, 2-stage industrial wet/dry vacuum delivers high-lift suction, rugged construction, and excellent mobility for pro, contractor, and industrial use. Our powerful 11.5 amp motor drives two blower wheels to create powerful high-lift suction and more efficient airflow, resulting in industry-leading performance and quieter operation compared to similar vacs. This motor is backed by our lifetime warranty and on average will run for over 700 hours. The RV2400A features a sturdy cart design with push handle and large rear wheels making this vac easy to transport up/down stairs or over rough job sites. The included Professional Grade Hose is designed to provide ultra-flexibility that wont pull loose during use, has a smooth interior to reduce clogging, and is four times more durable than our standard hose. This RIDGID 53 Litre (14 Gallon) Professional Wet Dry Vacuum is designed to provide powerful suction with a rugged, durable construction. The large 53-litre (14 gallon) two-piece heavy duty drum provides a capacity capable of handling big job-site clean ups. The 6 peak horsepower motor with patented Scroll Noise Reduction delivers the suction power necessary to handle tough clean-up chores yet is quiet compared to other vacs. The included VF5000 Fine Dust Filter captures 99.5% of dry wall dust particles and the patented Qwik Lock<sup></sup> Filter Fastening System offers secure tool-less filter removal for easier cleaning and replacement. The 2-1/2 inch. 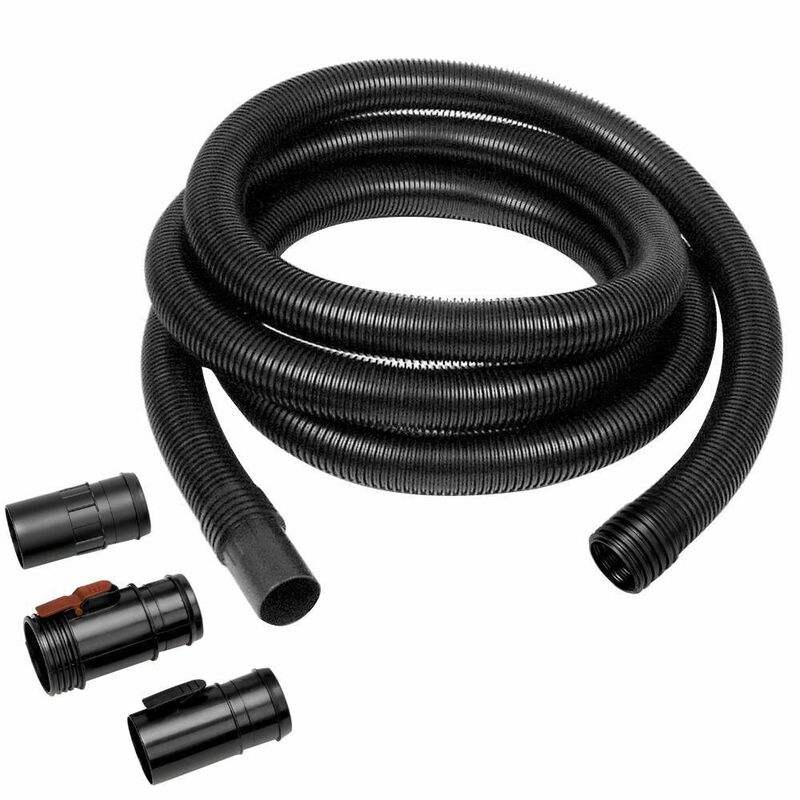 (6.4 cm) by 7 ft. (2.1 m) Dual-Flex Locking Hose provides secure, uninterrupted cleaning. This shop vacuum also has an oversized drain opening, on-board storage, casters with 360-degree mobility, and blower port; meeting the demands of any Pro contractor or DIY home owner. Accommodates all RIDGID 2-1/2 inch. (6.4 cm) diameter accessories. 2-1/2 in. x 20 ft. (6 m) Universal Wet/Dry Vacuum Hose Whether you need to replace the hose that was originally included with your vac or want the extra reach of a longer hose, the RIDGID family of hoses has a solution for you. This RIDGID 20 foot Locking Wet/Dry Vac Hose contains all the great features of our standard replacement hose and is nearly 3 times the length. It includes all of the adapters needed to fit any RIDGID and most other brands of vacuums. 2-1/2 in. x 20 ft. (6 m) Universal Wet/Dry Vacuum Hose is rated 4.6 out of 5 by 655. Rated 5 out of 5 by Sal from Like the reach. You don’t have to move the... Like the reach. You don’t have to move the unit as often. Rated 4 out of 5 by James from Easy to assemble and great for reaching a larger area... Easy to assemble and great for reaching a larger area without having to pull around the vacuum. Rated 5 out of 5 by Lucas from Exactly as advertise.... Exactly as advertise. Rated 5 out of 5 by Fbreferee from It does what it is supposed to do. It does what it is supposed to do. Bought this for my 3 gallon Ridgid vac (https://www.ridgid.com/us/en/3-gallon-portable-pro-vac) but it doesn't really fit...I have to force it on the vac itself, and no attachments fit, even with the included adapters, plus there's no collar slider. Why? My shop vac hose fitting and the vac port measures 2 1/4&quot;. There is some confusion regarding hose sizes. Will this 2 /2&quot; hose fit? The 2 1/2&quot; diameter size is a fairly standard size for wet/dry vacs and I have never seen a 2 1/4&quot; vac inlet or hose. &nbsp; If you have a Shop Vac or RIDGID with a larger capacity, this hose will fit.